The TE TE TE Traders Expo is an exhibition for handicrafts in medium-scale production, slated for its sixth show this year. Created as a place that bridges the divide between creators who work on a small scale in various locations and buyers who handle distribution, the show is gathering attention as an opportunity to show the state of modern handiwork. 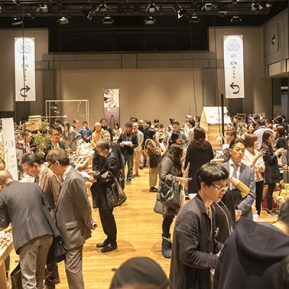 TE TE TE Traders Expo 2017 was held at Spiral Hall in Minami-Aoyama on February 8-10, 2017. This sixth show featured 100 exhibitors from around Japan, and 3,270 visitors attended over three days. Many products showed regional characteristics and their handmade backgrounds, worthy of a trade show with a medium-scale production and handiwork theme. At 10:30 in the morning, a crowd of people had formed outside Spiral Hall to wait for the TE TE TE Traders Expo to open. At 11, people flowed into the venue as the doors opened. The venue was divided into three areas—Sections A, B, and C—lined with the 100 exhibitors’ booths. An average of 1,000 buyers a day attended TE TE TE Traders Expo 2017. In accordance with the event’s philosophy of linking the creator, conveyor, and user, many visitors could be seen going beyond simple business deals and listening intently to exhibitors talking about the background of their creative process. Colorful Japanese paper not used in “Yamaga Toro” lanterns creates a product that fits in modern living spaces. “Yamaga Toro” are lanterns crafted from Japanese paper, passed down for 600 years. They are an indispensable part of a shrine festival in the city of Yamaga in Kumamoto prefecture. The form of a metal hanging lantern is created with Japanese paper, then placed on the heads of female dancers. It is one of the best-known crafts representing the everyday culture of Yamaga. TÔRÔ is a mobile in a stand, created with nothing but handmade Japanese paper and a small amount of glue. The hand-crafted creation sways lightly and gently in the breeze. With no margin or overlap for the glue, a traditional technique is used to create beautiful seams using just the thickness of the paper for a texture not found in most Japanese paper crafts. Hirotaka Nakashima, the producer and lantern maker. Takazawa Candle from the city of Nanao in Ishikawa prefecture exhibits their “urushi candles”—Japanese candles made with wax from the fruit of the lacquer tree. In the Noto region’s Wajima, efforts are being made to plant lacquer trees to protect lacquerware crafts using domestic urushi lacquer. To support those efforts, Takazawa Candle has created a product using wax squeezed from the fruit of the lacquer tree. Fruit of the lacquer tree. Takazawa Candle says they started harvesting lacquer tree fruit last year. “Traditionally, Japanese candles have been made using wax from the fruit of the wax tree for ages. The wax tree and lacquer tree are both in the sumac family, and the fruits have very similar properties. This project got started in the hope that the lacquerware from Noto’s Wajima and Japanese candles could support each other and grow,” says Hisashi Takazawa of Takazawa Candle. 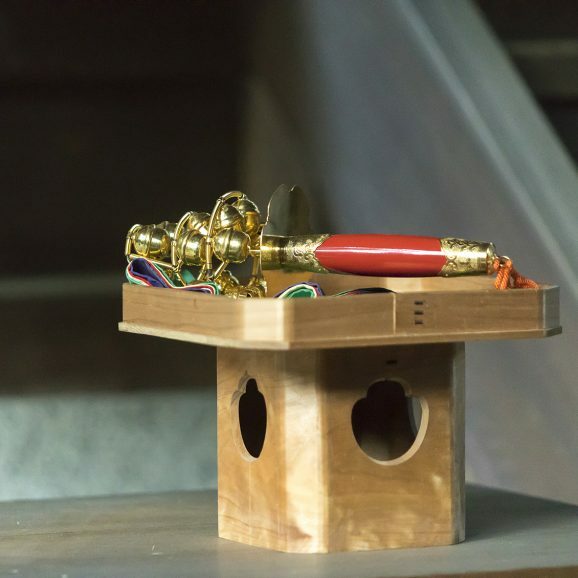 A new type of incense, “hibi” is a matchstick made of incense that does not require an ignition tool. After striking a match, fragrance emanates from the matchstick made of incense and lasts for ten minutes. The design team “torinoko” presents the “dot” paper item series that makes use of Braille embossing produced by a support facility for the visually handicapped. The project, which creates envelopes and mini gift envelopes with Braille designs, also creates a framework to link the support facility for the visually handicapped with society at large through design. Braille embossing uses two metal plates on top of each other to create text or designs with raised dots, then places paper between them and sends them through a roller press. Braille textbooks produced at the support facility for the visually handicapped. [Yama no Katachi] designers Osamu Suto (left) and Shuhei Shibayama (right). Needlework amulets created with the theme “praying heart.” The amulet bags are produced by Soushi, which continues the tradition of Yamagata needlework. The amulet inside is by Katsunobu Yoshida, a designer living in Yamagata who also created the graphics for TE TE TE Traders Expo 2017. Dishes that reflect the characteristics of Koishiwara, which is also a center of folk crafts, adapted to modern eating habits. “It would be nice if I could exhibit with my husband next time,” says Naoko Kajiwara of [Keishuugama]. The products made by forming porcelain clay in plaster molds follow in the footsteps of modern Danish design. Tatsuro Maeno, who creates his ceramics in the city of Chigasaki in Kanagawa prefecture, makes use of his experience studying design in Denmark and combines it with traditional Japanese ceramics techniques. The graceful forms and lively colors of his dishes and flower vases have a mysterious appeal that is neither Japanese nor Western. The “Meoto Cup” series, with a theme based on the colors of France’s four seasons.